Andrew Jackson is roasted over the fires of "Public Opinion" by the figure of Justice in a cartoon relating to the controversy surrounding Jackson's removal of federal deposits from the Bank of the United States. Jackson, with the body of a pig, is prone on a gridiron over a stone barbecue oven. The fire is stoked by former Secretary of the Treasury William Duane, at lower right, while Jack Downing, lower left, splits kindling. Jack Downing: "I jest split a little kindleying wood, so Amos can jest make Broth for all hands &c."
Duane: "I am opposed to Removing the Deposits, as I was when I was Secretary, but prefer gently Stirring them up." 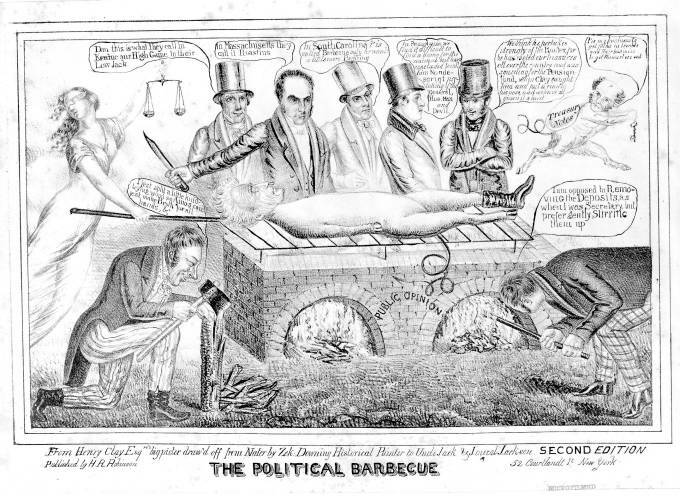 Five men, opponents of Jackson's bank program, stand behind the barbecue. They are (from left to right) Senators Henry Clay, Daniel Webster (holding a knife), William B. Preston, Bank president Nicholas Biddle, and an unidentified fifth man. Vice-President Martin Van Buren, as an imp, flies off to the right with a sack of Treasury Notes over his shoulder. Clay: "Dan this is what they call in Kentuc our High Game to their Low Jack." Webster: "In Massachusetts they call it Roasting." Preston: "In South Carolina t'is called Barbecue only he wants a little more Basteing." Biddle: "In Pennsylvania we find it difficult to find a home for the animal but have concluded to call him Nondescript pertaking of the General, Hog, Man and Devil." Fifth man: "We think he pertakes strongly of the Rooter, for he has rooted our treasures all over the country and was squeeling for the Pension-fund when Clay caught him and put a ring in his nose, and we've all given it a twist." Van Buren: "T'is my business to get folks in trouble and their business to get themselves out."